Many of the high speed intercity passenger trains that ran in the overhead electrified territory were powered by a single electric loco. This unit apparently has plenty of power as it was able to accelerate 8 or more coaches quite quickly. At the other end of the train would usually be found a combination cab control/baggage car. At a glance, this car looked like some of the diesel units, but it was missing the smoke and noise. 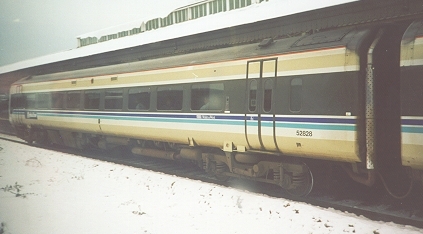 Diesel powered high speed intercity passenger trains were usually powered by a unit at both ends of the train. Even with two units, these trains didn't seem to pull out of the stations as quickly as the electric trains. Intercity trains run between major cities at very high speeds. However, there were many "local" trains running that maybe got to 60 or 70 mph and stopped much more often. Most of these trains are MU self powered cars, some electric, some diesel. 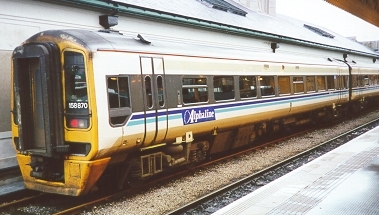 This set is a Wales & West "Alphaline" train composed of diesel powered cars. These train usually ran in two car consists with a control cab at either end. On our move from London to Cardiff, it was quite cold and it had snowed the night before in southern England. Even 3" or so of snow was enough to snarl the highway system, but the trains were essentially unaffected. This set of electric cars were caught at Waterloo East station headed to Charing Cross station. 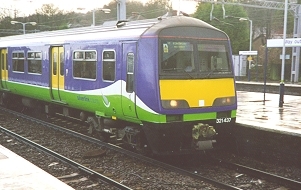 In southeast England, all the lines are 3rd rail electrified and most of the equipment is electric. 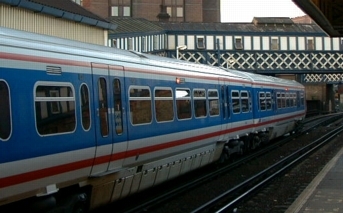 These cars are used primarily for commuter traffic to and from the communities in southeast England. 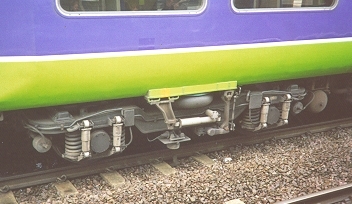 The RDC and electric MU car sets are connected with a combination coupler and buffer. 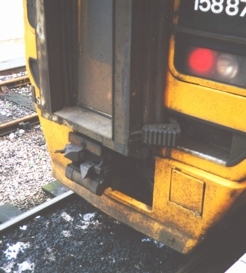 This arrangement removes all slack from the consist resulting in very little jerking as the trains started and stopped. In the case of the RDC's and many of the 3rd rail electric cars, most of them have a control cab so that they could run alone if needed. This car has a control cab and a vestibule so that it can be used in multicar consists as well. Commuter trains on the lines north were electric but ran from the overhead catenary. These trains were set up differently. There were cab cars that could only be used at the end of a train because there is no vestibule. These cars could control a train but could not power it. The cab control cars and regular coaches of these trains ran on unpowered trucks. These trucks rode extremely well and appear to use a torsion bar as their primary spring. Only one car in each 4 or 5 car train has a pantograph to pick up power from the overhead. 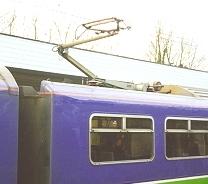 The roof at one end of these cars was depressed to clear the pantograph. These power cars did not have control cabs and were usually found in the center of the train. 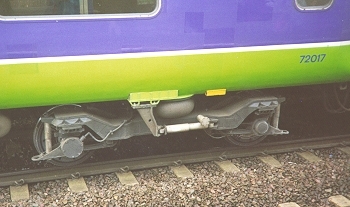 The power car also had a different truck with heavier springs to accommodate the significant additional weight of the electrical components and the traction motors. These cars had the distinctive hum of a transformer when the train accelerated and didn't ride quite as well as the other cars, probably due to the stiffer springs. There were a variety of B-B and C-C freight diesels scattered about. Most of these would run as a single unit with a relatively short unit train of some kind of freight car. 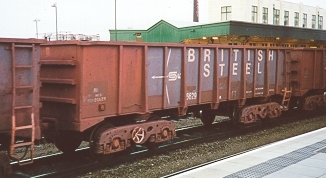 Single stack containers, coil steel, gondolas and side dump ballast cars seemed to be the most common. I did see several 4 wheel cars that appeared to be ore or perhaps coal carriers. 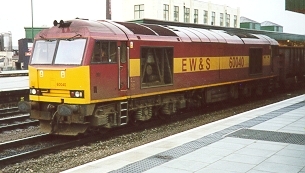 Royal Mail unit trains also ran in with the passenger trains. This lonely flat car was about the only piece of general freight equipment that I saw in the whole trip. It looks pretty similar to an older US style car. I saw several unit trains of gondolas near Crewe. There was a British Steel facility near there as well. 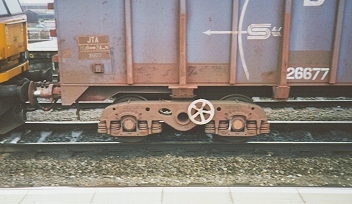 These cars use a sort of hook and loop coupler arrangement. There is a hook on each car and an adjustable loop is locked over the hooks. Slack is controlled by the sprung buffers on the cars and the locos. The trucks on these cars look a little odd to an American eye. The axles are individually sprung and the hand brake wheel is mounted right on the truck. I saw several other designs of freight trucks, but these were the only ones that I got a good picture of. 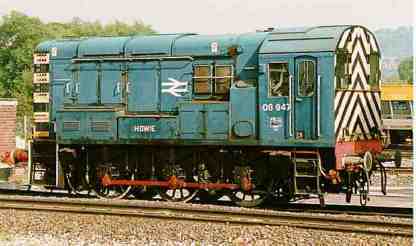 I saw about 20 of these 350 hp English Electric Class 08 "shunters" scattered throughout England. However, I didn't get a good picture of any of them. This photo from Railways On Line is used with permission. There were over 200 of these locos built, many of them are still in service after more than 40 years.